The House of Representatives Dec. 8 approved 360 to 61 legislation that would authorize over $10 billion in federal dollars for the Army Corps of Engineers to carry out dozens of water transportation construction projects. The “Water Infrastructure Improvements for the Nation (WIIN) Act,” S. 612, is the product of months of negotiations between the House and Senate to reconcile their respective water infrastructure bills. The measure will allow 30 new major construction projects in 19 states to move forward, pending funding through the annual appropriations process. In addition, eight more projects that have already been authorized would receive additional funds for lock, dam, port and waterway construction projects. ARTBA worked with its allies on Capitol Hill and other stakeholder groups over the past several months to push for enactment of a new maritime construction law. As part of this effort, we urged House members to join Rep. Mark Sanford (R-S.C.) and Lois Frankel (D-Fla.) in a letter asking the House leadership to take up the water infrastructure legislation before Sept. 30, which they did. In a Dec. 8 letter, ARTBA President and CEO Pete Ruane urged all Senate and House members to support the bill. The WIIN Act now heads to the Senate. Several Senators, however, are complaining about the inclusion of some provisions they view as too controversial for a bill that is normally bipartisan, the path for enactment in the Senate is less clear. Votes on the measure could potentially taking place over the weekend and into the week of Dec. 12. In his weekly report of the chamber’s activity, House Majority Whip Steve Scalise (R-La.) 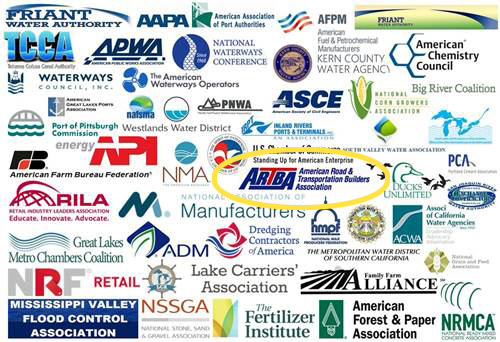 today including the graphic shown at top of all the groups supporting the WIIN Act to demonstrate the measure’s broad-based support.